Everybody loves jewellery but we rarely think about the effects of producing these pieces! But we know that this $300 billion industry has been linked to many environmental and social negative impacts, from unsustainable mining processes to unethical treatment of miners (most notably blood diamonds). But how exactly does this fashionable and attractive industry hurt the environment and communities? Jewellery has traditionally been produced by using precious metals - diamonds, silver, gold, gemstones and many others, mined from territories around the world. However, the process of extracting these metals can have real and serious effects on the environs. For example, excavations can lead to disruption of ecosystems, loss of biodiversity (both vegetation and the species living in the ecosystem) and erosion when the top soil is exposed. The process of production can also lead to pollution - for example, cyanide is a toxic chemical regularly used for gold mining. Waste from this process (and others using similarly toxic chemicals like sulphuric acid and mercury) runs off into waters, soil and the atmosphere, causing pollution. Gold in particular is one of the most common precious metals used for mining, but its extraction requires huge amounts of water thus putting a strain on the ecosystem. Even manufacturers are beginning to feel the strain as was the case with the AngloGold Ashanti company which had to suspend operations at two sites in part due to water resource constraints. Social issues abound as well, notably the use of local labour but with disregard to their safety and wellbeing, as well as unfair payments to maximise profit. Furthermore, most mining for precious metals is done in developing countries, notoriously in conflict-prone areas, which rarely have the laws or the enforcement capabilities/will to protect local labourers. The contaminated lands and reduced water resources puts further strain on communities already challenged by poverty as it adversely affects the health of their farm lands. How can jewellery companies do things differently? Traceability and sustainable supply chains: Where do the precious metals come from? Global supply chains have become increasingly complex; but knowing where your stones are mined means you are able to understand how extraction has affected the environment, workers and communities. This is the first step towards action - whether its corrective action or boycott, to ensure that jewellery is produced in a humane and environmentally-friendly way. Industry alliances and certifications: Sustainable jewellery companies need to be active in the move towards sustainability. This means being part of the discourse to develop industry-wide sustainable practices. Such organisations working towards a more sustainable industry include the Responsible Jewellery Council which issues a code of conduct for responsible business practices, and the Kimberly Process which aims to reduce the purchase of conflict diamonds. Employees knowledge: Employ designers who are aware of the environmental impacts of traditional jewellery making, and who are open to experimentation and using alternative materials and techniques (e.g. solder-free techniques). Teach your employees to work using such methods, and most importantly, to have a mind-set of innovation. 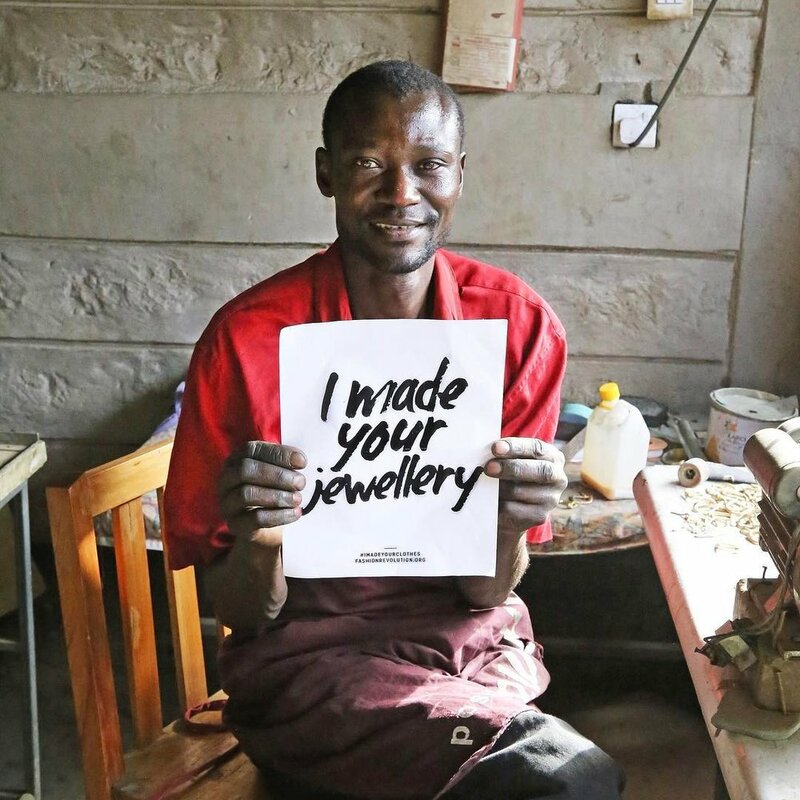 Purchase directly from local artisans: Brands who purchase directly from local jewellery artisans empower these locals and their communities economically. With this strategy, the company does away with sweatshop and inhumane conditions the industry is well known for. There is also the added bonus of simplifying the supply chain and having more control over the supply process. Popular sustainable jewellery brand Soko shops directly from local artisans. Fair trade: It’s not enough to purchase directly from local artisans. Do you pay them fairly? Brands that pay both their artisans and employees competitively contribute directly to social inclusion and sustainable development. Popular brand Ten Thousand Villages is a pioneer of the fair trade movement and practices same with their local artisans. Recycled materials: Recycling is a viable option because these precious metals rarely loose their value. A study commissioned by Pandora showed that the environmental impacts of jewellery production can be reduced by up to 95% if recycled materials are used! And not only recycled metals could be used, but e-waste and other materials could make fancy embellishments for jewellery. Check out Leo Black who only uses recycled gold. Resource use and waste management: Innovations in technology could be key in finding ways to mine gold using less water (during the separation process) and using proper chemical disposal processes. Having a procedure to ‘buy-back’ jewellery and upcycle to reduce waste could also be a viable option. Transparency: Companies striving towards sustainability are not afraid to report the targets they have set, and transparently show how far they have come and how much further they need to go. At a minimum, material issues to report include supply chain, traceability, fair trade, waste management and environmental pollution. Large companies such as Pandora and Tiffany & Co have started such reporting. Unfortunately, this is an industry that has not seen as much consumer demand for sustainable jewellery as for example, the fashion industry. Still, there are many small jewellery companies focusing on sustainable design with corporations still far behind. But even with the influence these corporations have, fragmented small businesses dominate this industry and have a large part to play in the sustainability discourse. But this fragmentation may also prove a challenge when agreeing industry responsible practices. For case studies on how jewellery companies are working towards sustainability, read this interview about Pandora’s sustainability practices. Similarly, for a smaller jewellery company, read this interview by Emma Grace Jewellery.